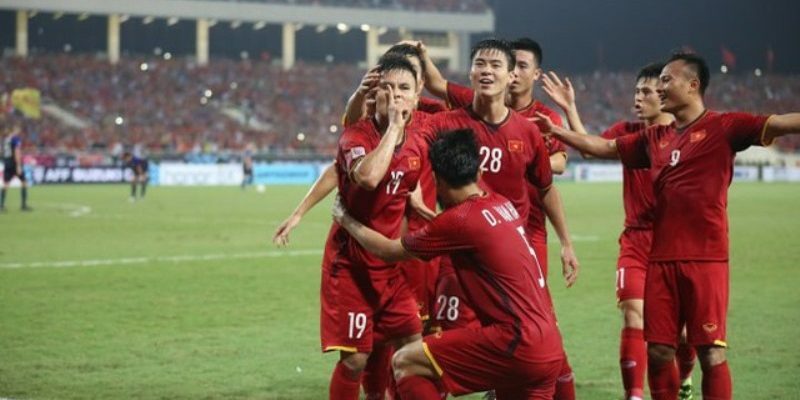 HANOI (6 Dec 2018) – There was no drama tonight at the My Dinh National Stadium as a late charge saw Vietnam beating the Philippines 2-1 in the second leg semi-finals for an aggregate 4-2 victory. In the two-legged finals in a few days, Vietnam will take on Malaysia with both teams chasing only their second regional title. Coming off the back of a 2-1 loss at home in Bacolod City, the visiting Philippines side knew that they have their work cut out as they needed to find the right balance in their offensive play while at the same time protect their back line so as not to fall further behind. For Vietnam, they are under pressure for different reasons where they need to protect their slim lead while at the same time avoid the meltdown they suffered in 2014 when they crashed out at the same stage. “From what we observed in the first leg, we knew that the Philippines will be tired up into the 65th to 70th minute, so it was for that reason we defended in the first half and then attack in the second half,” added Vietnam head coach Park Hang-seo. Against such a background that Hang-seo chose to play basically the same line up as he had done a few days earlier in the first leg with Nguyen Anh Duc the lone striker but ably supported by two dedicated attacking midfielders alongside forward Phan Van Duc. Hang-seo’s opposite Sven Goran Eriksson chose to play reserve keeper Patrick Deyto and also introduced Iain Ramsay to the mix. It was another physical display from both teams with Stephan Schrock being given a free role while Nguyen Quang Hai – who was awarded with the Honor Man of the Match award – once again in the thick of the action. Chances were few at the start with Phil Younghusband floating in some crosses that were easily cleared by the Vietnam backline. For the home team, they were not playing it defensive but in spite of the several chances created, neither Quang Hai, Anh Duc nor Nguyen Trong Hoang could get the last touch. The second half half was very much the same as it was in the first with the Philippines pushing hard while Vietnam were content to look for the opportunity at the break. Several exchanges later, Pham Duc Huy picked up the first yellow card of the game as not too long afterwards, the change for the wily Nguyen Cong Phuong would change the rhythm and ultimately the result of the tie. Seven minutes to the end, a cross from Van Duc from the right saw a fine finish from Quang Hai as Cong Phuong then made it count three minutes later from close. The Philippines then finally got the goal they were looking with Amani Aguinaldo stabbing home from inside the box. But the goal came a little late for the Philippines as Vietnam rode through the remaining few minutes to give the home fans plenty to cheer. “Maybe we lost it at home a few days ago but this game is history for us. Now we will just have to move forward,” added Eriksson.